These two concepts seem to be contradictory, or at least unconnected. On the one hand, God's name is majestic in this plain ol' transitory space we call earth, but at the same time he is glorious and above the highest heavens. This collision of different worlds is played out in the life of Israel. It is made clear in the life, death, and resurrection of Jesus. 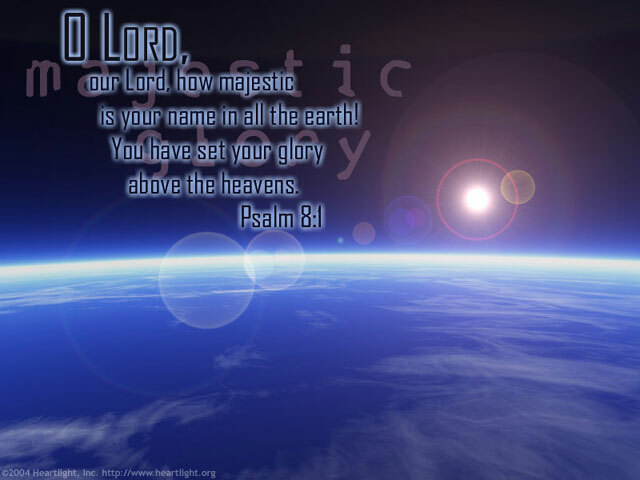 It will be made glorious in us, who will one day share in the glory of the heavens because we have boldly declared the majesty of our LORD God on earth! Thank you, dear Father, for Jesus' promise that if I honor you and confess him on this earth, you will gladly honor me and call my name in the presence of your angels when the time comes for me to stand before your throne. In Jesus' name I thank you. Amen.